To better understand their mission in Iraq, military forces need to know more about the country’s history, according to Geoff Emberling, Director of the Museum of the Oriental Institute, who briefs officers in U.S. military units before they are deployed to Iraq. Emberling, who lectured recently to officers in Bosnia and Germany, and who also has delivered briefings around the country, will talk about his experiences at a special Veterans Day program at 8 p.m. Friday, Nov. 11 in the Oriental Institute’s Breasted Hall. The talk, titled “War and Peace in the Cradle of Civilization: Educating American Soldiers about Ancient Iraq,” is open to the public for a $10 general admission fee; admission for University students with a valid I.D. is $7. Active military, reserve personnel and veterans will be admitted free. Pre-registration is recommended and may be completed by calling (773) 702-9507. “I have done the briefings as part of the Leader Development and Education for Sustained Peace program,” Emberling said. LDESP is a graduate-level program, based at the Naval Postgraduate School in Monterey, Calif., which provides officers with a deeper understanding of the areas to which they have been assigned. The program was started during the conflict in the Balkans, when military leaders realized they needed more knowledge of the history and customs of the region in order to help secure peace. 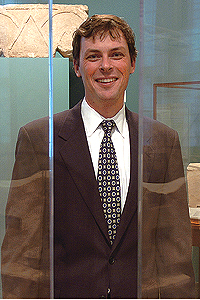 “I started doing the briefings in December of 2003, after I was asked to participate by a friend who is an anthropologist at the University of Michigan,” said Emberling, who has done archaeological work in Syria. “I was asked to talk about the history of the region, but in order to make it matter for the officers who were going there, I decided to do something different than giving them dates and names of rulers. I’ve concentrated on the themes that persist in the society today, which have deep roots in the country’s heritage,” he explained. “In our society, history often doesn’t seem to matter very much because we are so focused on change. In the Middle East, history more clearly defines the present. The society has durable structures that go back thousands of years,” he said. Those structures have persisted, despite invasions, regime changes and major societal transformations, such as the emergence of Islam as the dominant religion. One of the durable structures is a dual political system, in which there is an urban-based power as well as a tribal government that operates as a parallel. Each system has its rules and laws. “This system goes back to at least 2000 B.C., and we read about it in letters written in cuneiform,” Emberling said. Gender relations in Iraqi life also are historically based. In Iraq, as in much of the Middle East, men dominate public spaces, while women are in charge of the domestic sphere. “Everyone thinks this separation is due to Islam, but in fact, it developed long before the emergence of Islam,” Emberling said. This society’s understanding of justice and law also can be traced back to early times, said Emberling. Although there are strict standards that demand firm punishment for certain offenses, there also is a strong tradition of accommodation and negotiation. “We see this back to the times of Hammurabi, whose laws prescribed harsh punishments,” Emberling said. “When we read the contemporary accounts of how the law was actually enforced, we learn that there was a great degree of flexibility in the way justice was practiced,” he said. Drawing from such familiar sources as the Bible allows Emberling to educate the soldiers by linking ancient Iraq to modern- day religion. Stories in the Bible are connected with the country in many ways. The tower in the Tower of Babel story, for instance, suggests the ziggurats of ancient Mesopotamia and the story of Noah’s flood are similar to other stories recorded by the Sumerians.